Photo by Madeline Murphy A ribbon cutting to announce the grand re-opening of the Dils Center was held Saturday in downtown Parkersburg. From left are Missy Fox, Bill Moriss, Jeff Westfall, Emma Stubbe, Morgan Stubbe, Ben Stubbe and Jessie Siefert. 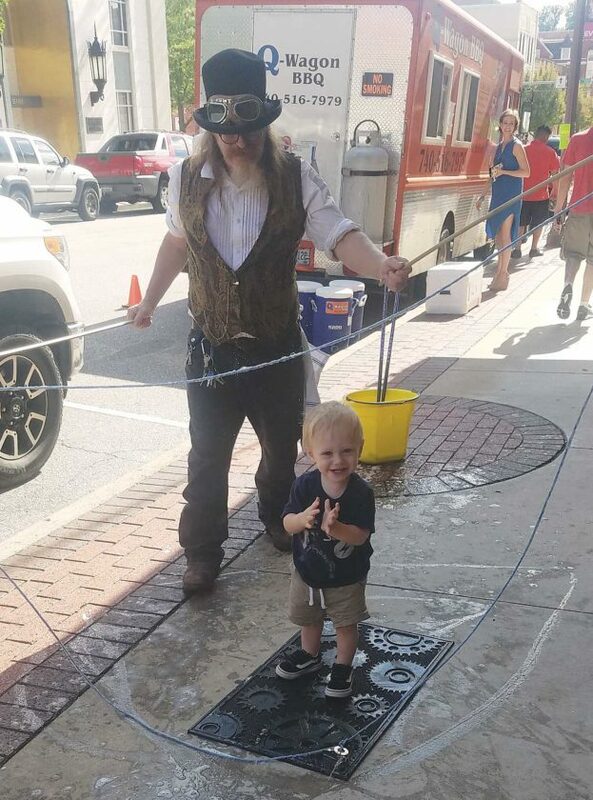 Photo by Madeline Murphy Sully Bailey, 1, enjoys the bubbles provided by Professor Phineas T. BubbleMaker at the Stubbe Fest with his parents Caci and Garrett Bailey on Saturday. Photo by Madeline Murphy Crowds of people went on detailed tours of the Dils Center on Saturday. Photo by Madeline Murphy People take a break from the other activities to sit and listen to the Jake Eddy band perform during the Stubbe Fest on Saturday. 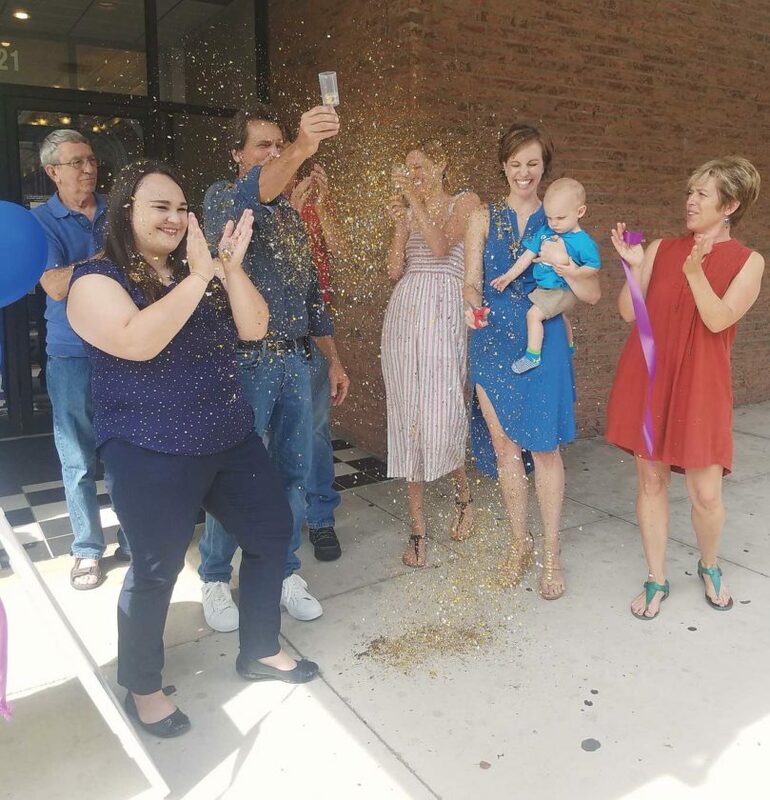 PARKERSBURG — The Dils Center held its grand re-opening on Saturday and owner Morgan Stubbe said she has received so much support since the death of her husband, Todd, on July 4. “We purchased the building back in November, and have been working to repair the event center since,” said Stubbe. “There are four floors and a basement,” she said. “I am really happy that Morgan has taken the initiative to finish what my dad wanted,” said Emma Stubbe, Todd’s daughter. “Cosmic Pete’s, a music venue for all ages, is to be located in the basement and will be opening this month,” said Morgan Stubbe. “The second floor is home to many small businesses right now, and we still have available space,” she said. According to Stubbe, the third floor will be used as office space and within the next five years they hope to turn the fourth floor into studio apartments. Todd and others were working on renovating and updating the Dils Center on Market Street at the time of his death. “I knew Todd for 25 years,” said Jeff Westfall, a very close friend of Todd’s that has helped get the Dils Center open again. “The weekend of the funeral, we had a meeting and all agreed that we needed to do something, we weren’t going to let the dream die with him,” said Ashley Perry, president of the foundation and owner of Anchors & Arrows Boutique in the Dils Center. “When it comes to keeping his dream alive, there is no doubt in my mind that helping Morgan bring life back to downtown is what I want to be doing until my last breath,” said Westfall. Perry said that in Todd’s honor, they established the foundation as a 501-c3 nonprofit organization. * To provide scholarships to young aspiring entrepreneurs. * To continue work to preserve and revitalize historical buildings and landmarks of greater downtown Parkersburg. * To help improve tourism and economic development for small businesses in downtown Parkersburg through arts, entertainment and events that the foundation can plan and coordinate. “He set an example for all of us of how to be better versions of our selves,” said Westfall. 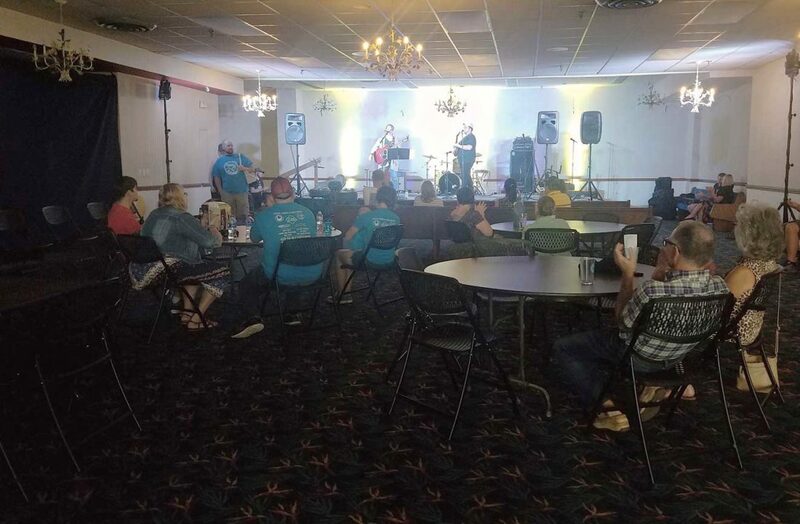 According to Stubbe, the Stubbe Fest offered tours to people who attended, so that the community could get a better idea of the future opportunities that have arrived to the Parkersburg downtown. 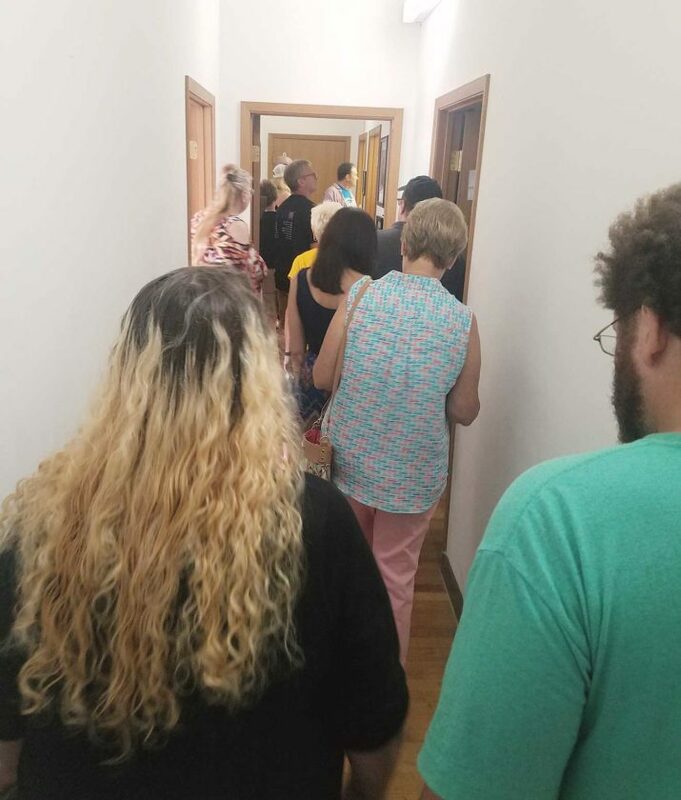 “I am very excited to have a business downtown,” said Kelli Backos, the owner and operator of her private business, Mid-Ohio Valley Massage, located in the dils center. “I do more than just massages, there is hot stone therapy, stretch therapy, paraffin wax treatments, sell essential oils for aromatherapy and exfoliating sugar scrubs here as well,” said Backos. “My business has started to grow since moving out of my basement and into the Dils Center,” said Deb Lorentz, owner of Deb Lorentz Photography. “One of the spaces we have is decorated for a small wedding for those who would rather sign and go, since the courthouse no longer does weddings and I am a certified officiate,” said Lorentz. Local food businesses from downtown showed up to help support the Dils Center re-opening, offering a variety of foods for those attending to try. Unity, a Bulgarian/American cafe located on Seventh Street right off Market Street, Elinies Greek Mediterranean Cuisine, a food truck that parks downtown on Wednesday and Thursday, Q-Wagon and Willy’s Hotdogs, located downtown and at the Point Park Marketplace were a few of the food services that showed up. “Here in downtown, we all want to support each other,” said Petia Johnson, owner of Unity. “I knew Todd personally, and was happy to come up here and show our support for Morgan and the rest of the Dils Center,” said Johnson. “It really is an amazing honor to be able to be here today seeing the support that has come together, and to really be an active part of continuing his dream,” said Westfall.